What does the term "stream" mean in the world of poker? 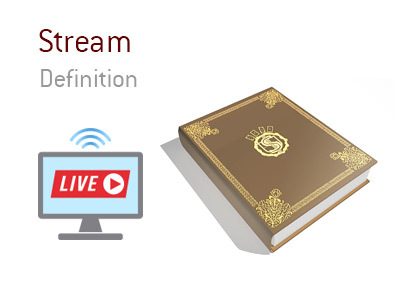 What is the definition of the term "stream"? Many poker players have taken to Twitch.tv in recent years to stream their poker playing exploits. Twitch.tv, which is owned by Amazon.com, allows people to stream their video gaming or poker playing sessions to hundreds or even thousands of people across the world. Most setups have the game that the person is playing taking up most of the screen, while there is a small box that features a video stream of the person where they are interacting with viewers and giving commentary on whatever game they are playing. Some poker players have gotten very popular via Twitch.tv, including the likes of Jason Somerville and Parker Talbot. Both of these players have managed to parlay their large audiences into sponsorship deals, as Somerville is signed to Pokerstars and Talbot is signed to 888Poker. Players can generate revenue for themselves in the form of subscriptions, donations or advertisements. Most poker streamers don't earn much, though the top tier streamers do it for a living, via a combination of subscription revenue and sponsorship money. For anyone who has a dream of securing a poker sponsorship, the best way to do so is to grow a large following on Twitch.tv.